Eva Zeisel’s Town and Country line for Minnesota’s Red Wing Potteries, Inc. is an icon of the twentieth-century table. Available in several colors, Town and Country reveals many things—from Zeisel’s unique biomorphic forms, to the emergence of informal dining during the 1940s, to foreshadowing the “atomic” look of tableware in the 1950s. These salt and pepper shakers epitomize her “playful search for beauty.” In 1948, two years after Town and Country was introduced, Al Capp’s cartoon character, the Shmoo debuted in the comic strip Li’l Abner. The uncanny resemblance between Shmoos and Zeisel’s shakers shows the popularity of biomorphic design during the post-war period. Town and Country echoes Zeisel’s Museum line of porcelain dinnerware for Castleton China Co., created in 1945. The Museum pattern was partially commissioned by The Museum of Modern Art and was the first modern-looking fine china dinner service to be made in the United States. Both the Museum and Town and Country lines gracefully unite style and functionality. Between 1929 and 1967, the year the firm closed, Red Wing had a penchant for both commercial success and ceramic artistry, manufacturing a large range of affordable glazed “artwares”. Prior to this, the company mainly produced utilitarian stoneware. Geared for mass production, Red Wing used molds to make their tablewares instead of hand-throwing or hand-building them. In Zeisel’s book, Eva Zeisel On Design: The Magic Language of Things, the designer eloquently discusses “togetherness,” which describes her holistic approach to design: “I have rarely designed objects that were meant to stand alone. My designs have family relationships. They are either mother and child, siblings, or cousins. 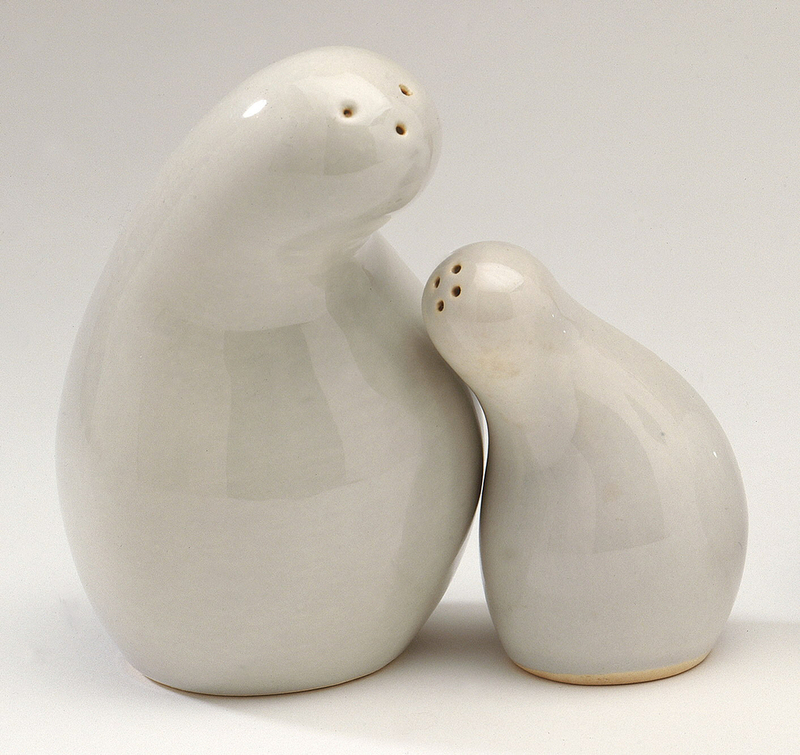 They might not have identical lines, but there is always a family relationship.” There is an almost magnetic rapport between Zeisel’s curvaceous Town and Country salt and pepper shakers: when together the forms intertwine and seem inseparable, and when apart they appear to yearn for each other. Zeisel’s fluid sculptural forms show her brilliant skills as both a ceramicist and designer. Her career began in Hungary as an apprentice to the potter Jakob Karapancsik. Her in-depth knowledge of clay is reflected in many of her commercial designs. Town and Country is charming because it brings thoughtful, lighthearted design to the tabletop. “Eva Zeisel: The Playful Search for Beauty” was the title of the Milwaukee Art Museum’s 2004-2005 exhibition on Zeisel’s work. Charles L. Venable and Tom Jenkins, China and Glass in America, 1880-1980: From Tabletop to TV Tray, (Dallas, TX: Dallas Museum of Art, 2000), p. 389. Eva Zeisel, Eva Zeisel on Design: The Magic Language of Things, (Woodstock, NY: Overlook Press, 2004), p.117. This week, we are celebrating work of National Design Award winners, on the occasion of the announcement of this year’s honorees. The annual Awards program celebrates design, in a variety of disciplines, as a vital humanistic tool in shaping the world. Eva Zeisel won the Lifetime Achievement Award in 2005.